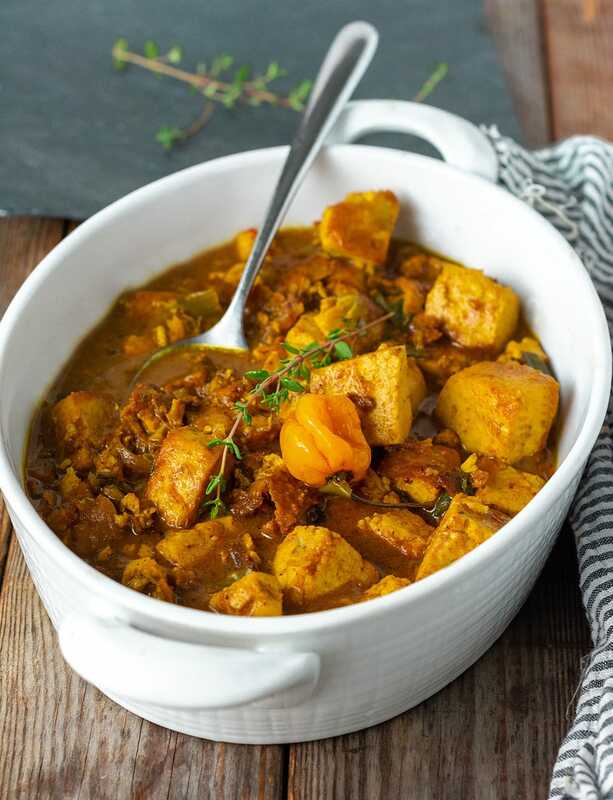 Flavorful Tofu Curry Recipe made with Caribbean curry flavors, onion, garlic, green onion, thyme, Scotch bonnet pepper cooked in curried coconut sauce. This amazing tofu coconut curry is ready in under 30 minutes. 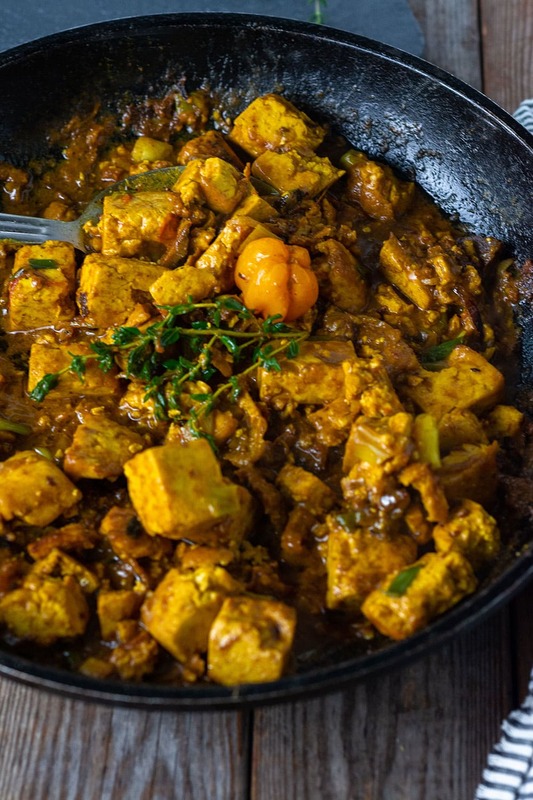 This vegan curry dish is so easy to prepare and flavorful, it is definitely one of the best ways you can prepare tofu. The combination of aromatic herbs and spices will transform bland tofu to another level. Serve it over my Jasmine Rice or Yucca. 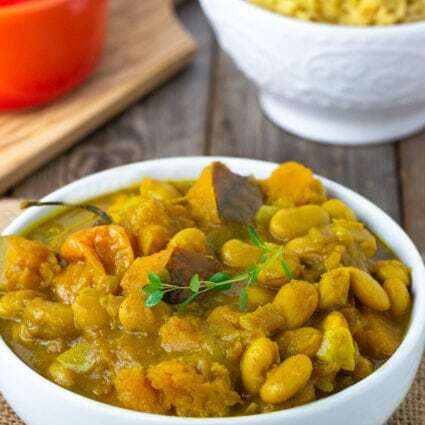 If you are a fan of curry recipes then check out my Vegan Curry Recipes. This irresistible tofu curry recipe is a must to add to your menu. You can use my Homemade Curry Powder recipe or my favorite gluten-free store-bought brand. 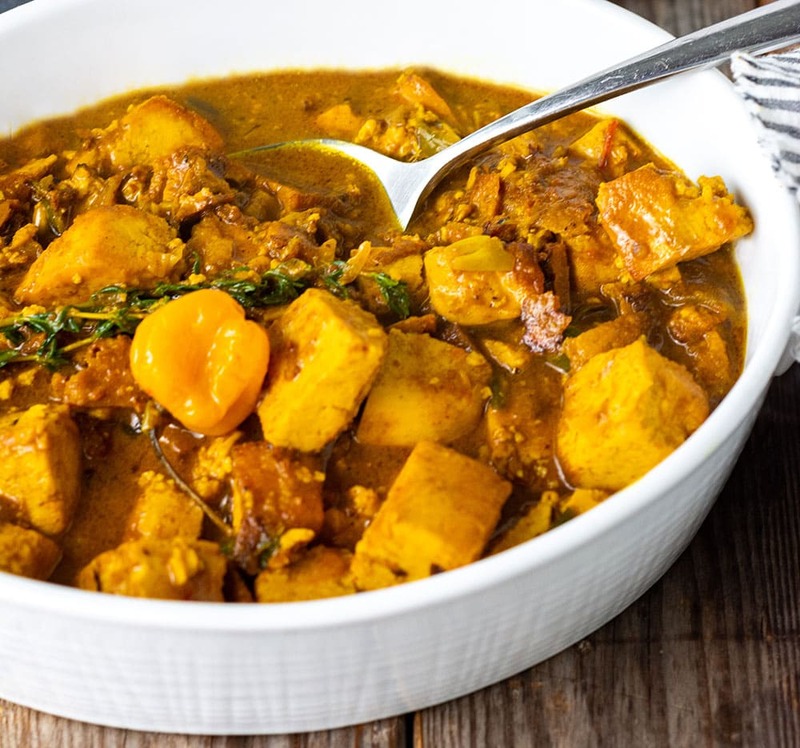 Enjoy this Jamaican curry without leaving your home, with lots of authentic Jamaican flavor s.
Scotch bonnet pepper is the pepper of choice for Jamaican curry, it is very hot so if you want a spicy tofu curry then you can deseed and add pieces to taste. If you are conservative like I am, then leave the pepper whole, so that it will flavor your dish without all that heat. If you don't have Scotch bonnet pepper, then habanero can be substituted or cayenne pepper. It's best to press tofu before cooking because tofu absorbs a lot of the water it is usually stored in. To press your tofu, cover tofu with paper towels or dishcloth and place on a plate with another plate on top of the tofu. Place something heavy on the top of the plate, like heavy books or a pot and let it drain for about 20 minutes. You can save yourself all that work by purchasing superfirm vacuum packed tofu instead, it is usually sold at most health food stores, Trader Joes and Publix. 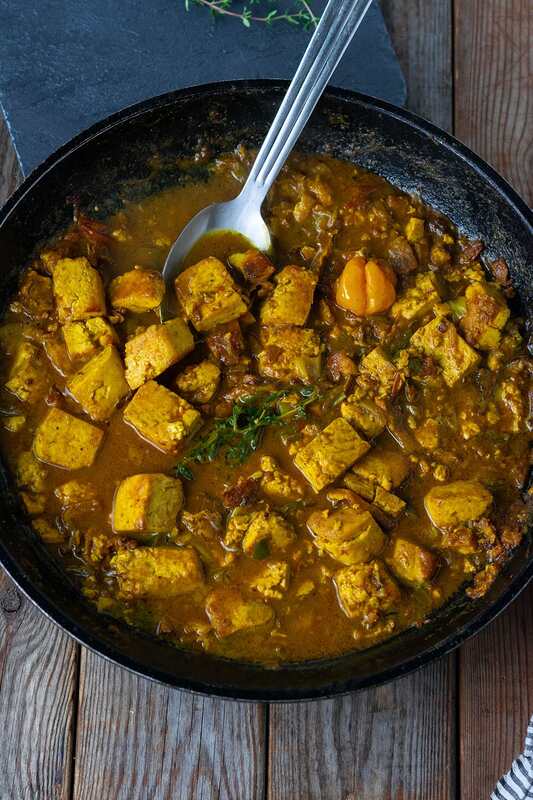 How To Cook Tofu For Curry? Saute tofu cubes in a large non-stick skillet on medium high with coconut or avocado oil until they are crispy. 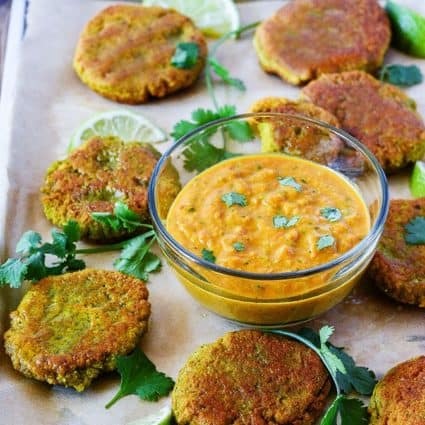 How To Make Vegan Curry Sauce? To make the vegan curry, add onions, garlic, and ginger, cook until onion is soft and fragrant about 3 minutes. Add curry powder, cumin, turmeric and cook for 30 seconds stirring constantly. Add chopped tomatoes, green onion, thyme, Scotch bonnet pepper or cayenne and stir to coat. Add coconut milk, salt or vegetable bouillon to taste and stir to coat with tofu. Cover skillet and simmer for 5 minutes. Garnish with chopped cilantro leaves. 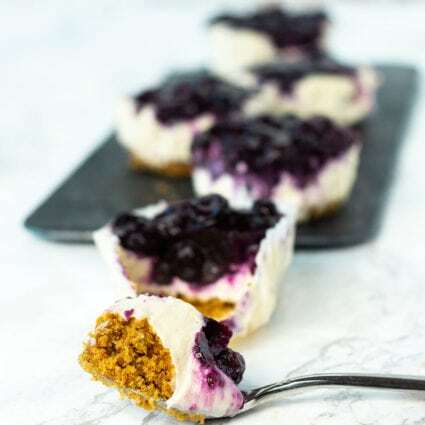 I know you guys will love this recipe and you will make it over and over. Be sure to leave your feedback in the comments below. What Other Sides Go With Tofu Curry Recipe? 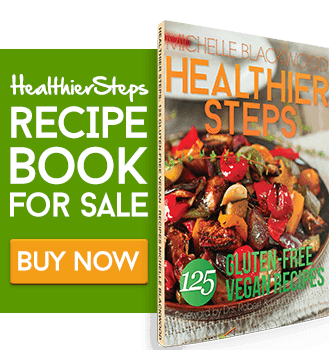 Are You Looking For More Tofu Recipes? Here Are Some! Toss tofu cubes with Bragg's Liquid Aminos or salt. Heat oil in a large non-stick skillet, add tofu and cook until crispy and lightly brown. Add onions, garlic, and ginger, cook until onion is soft and fragrant about 3 minutes. Add curry powder, cumin, turmeric and cook for 30 seconds stirring constantly. Cover skillet and simmer for 5 minutes or until sauce is thickened. Garnish with chopped cilantro leaves.